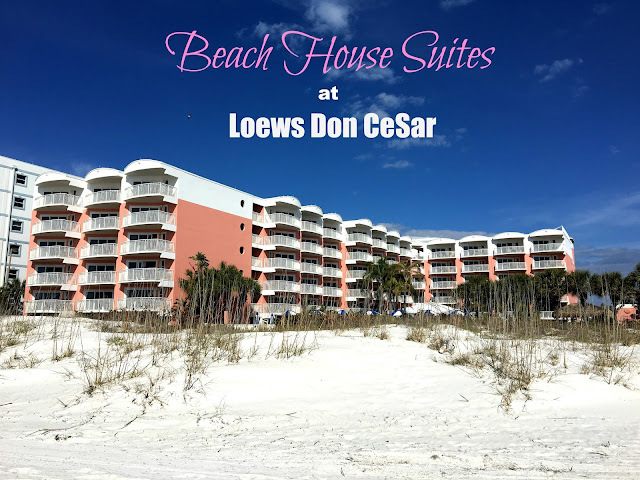 This past weekend, we had the wonderful opportunity to spend a few days at the Beach House Suites by Loews Don CeSar. The 70-room all-suite property is located in St. Pete Beach, a short half mile walk from the recently recognized Historic Hotel of the Year by Historic Hotels of America, Loews Don CeSar Hotel. In 2015, my parents stayed at the Beach House Suites prior to the $8 million renovation made to all the guest suites. I was able to go spend time with them during their trip. Fast forward to March of 2016 - I did not recognize the place upon walking in and that is no exaggeration. 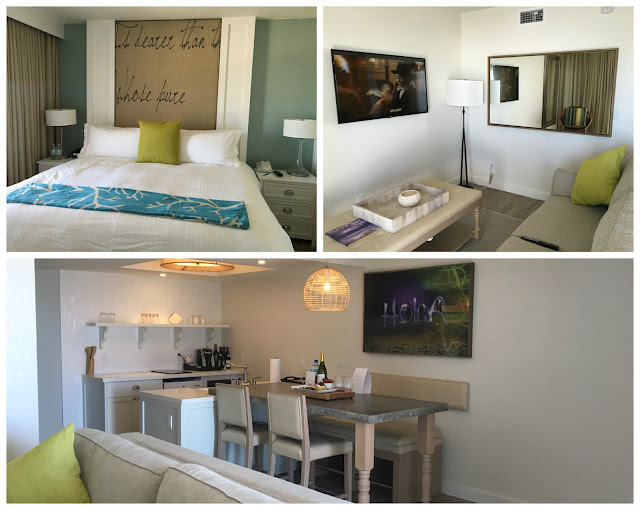 The Beach House Suites is modern, contemporary and all around amazing. The rooms are huge, starting at 600 SF. This will allow you to feel at home, with a gorgeous view and the first class amenities of Don CeSar. Each Beach House Suite has gulf-views and balconies. Along with the view, which never gets tiring, you will find a separate bedroom, living area with sofa-bed, dining room, washer and dryer, kitchenette with a microwave, mini-refrigerator, dishwasher and induction stove top. This is a huge plus for us as we typically make our own breakfasts and you can bring a lot of snacks. If you stay at the Beach House Suites you will get complimentary shuttle to and from Don CeSar. We never took advantage of this service since the weather was absolutely gorgeous during our short stay. However, with a quick call, you can be on your way to enjoy the amenities of the Pink Palace. Sometimes you need to unwind. The Don CeSar is an incredible property and is always busy. With only 70 rooms, the Beach House Suites will allow for a much quieter, relaxed vacation. The balconies on every of the 70 Beach Suites at Loews Don CeSar are so large you could do beach side Yoga on them. No kidding. I enjoyed breakfast every morning and was able to work a few hours from my balcony. Something about that view made the work day fly by. If you chose not to make your own breakfast, you can order room service from Don CeSar. In a quick 20 minutes, I received a hot breakfast in my room (poached eggs, fruit, sausage and fresh squeeze OJ).. They offer a variety of courses from various restaurants located in the main resort. You can even get homemade Ice Cream from Uncle Andy's Ice Cream Parlor. Every room at the Beach Suites has a gulf view. This allows every guest to enjoy the best sunset on the Gulf Coast from the privacy of your room. Regardless if you are at Loews Don CeSar or the Beach House Suites, you will be surrounded by polite and attentive staff. Every person we encountered went out of their way to make sure our trip was amazing. If you don't believe me, all you have to do is look on Trip Advisor to see what others are saying. If you stay at the Beach House Suites, you will still have access to all the amenities at Loews Don CeSar, including Spa Oceana, Health and Wellness Fitness Center, kids club and more. Along with the Sand Dollar pool bar at Beach House Suites, you can take a short trip to Loews Don CeSar and find yourself among some of the best restaurants and bars in town. We had a chance to dine at Maritana Grille and experience the brand new Rowe Bar which I will share in a separate post! For information or to book a room at Beach House Suites, visit https://www.loewshotels.com/beach-house-suites-by-loews-don-cesar or call 1-866-728-2206.